Dealing with cat urine is one of the most difficult parts of owning a cat. Regular household cleaning products will not get rid of the stains or odor, but there are some tried-and-true methods pet owners have perfected over the years. Get tips on which cleaning methods work best. Like all urine, cat urine is mainly made up of urea, urochrome and uric acid. Uric acid is the component of urine which makes it so hard to clean. 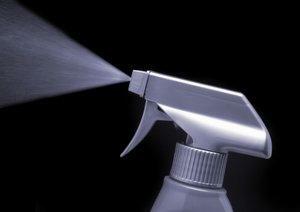 Most cleaning products will get rid of urea and urochrome, often creating the illusion that the urine has been removed. However, uric acid is made of crystals which are non-soluble and bond tightly with surfaces, thus traditional cleaning products cannot break them loose or dissolve them. When the other components of urine are removed, the appearance and odor often go away temporarily, only to come back when the area becomes damp. The traces left behind may not be noticeable to humans, but cats can still smell them and are attracted to the area for urination. Effective methods for getting rid of cat urine vary depending on the age of the stain. There are several methods. You may even want to try a combination of methods to completely clean the area. The first step to cleaning up any urine accident is blotting up as much of the liquid as you can. Once you've done that, it's time to apply one of the following cleaning solutions. For immediate cleaning, try white vinegar first. If the urine is on a solid surface, such as linoleum, a 50/50 mixture of vinegar and water in a spray bottle should work just fine. For fabric and carpets, try to absorb the urine first with paper towels. Then, saturate the area with vinegar. Let the area soak and air dry. This may take more than one application. If the odor is still there in a couple of days, or if your cat keeps returning to the area to urinate, you will need to use an enzyme cleaner. Cats learn to use the litter box with virtually no training. It is instinctive and they prefer to live in a clean place. Prevention is far easier than cleaning up cat urine. When cats urinate away from the litter box, there is always a reason. Most cats will not use a dirty litter box. If your cat is frequently "going outside the box", make sure that the litter is changed frequently. Some cats are pickier than others about this. Some cats will stop using a litter box that has been moved, is not in a private location, or that is being used by other cats. So, keep the box very clean and provide one box for every cat in your home. Urinating is a marking behavior. Sick cats, cats under stress, and cats that feel threatened by the presence of a new pet will often spray to mark their territory and to feel more secure. Old urine stains may be causing the problem. If a cat is spraying, the urine will usually be up high, about nose level for the cat, rather than on the floor, unless the cat is covering the smell of old urine. Even urine that is imperceivable to humans can be smelled by cats and dogs. They will continue to use the spot if there is any residue left behind. Spaying and neutering will often solve this behavior, so consult your vet about this issue and have your cat examined to see if an illness might be involved before you make any decision about altering your pet. Urinating in inappropriate places may be a sign of health problems. Bladder infections, kidney problems and crystals in the urine are some of the many health problems which may cause a cat to urinate in strange places. If your cat has always been good about using the litter box, and no changes have occurred within the household, take him to the vet right away. He could have a life-threatening illness. Almost every cat owner will have to deal with a few urine mishaps over the course of their pet's lifetime. An effective cleanser is the quickest solution. However, the potential of any cleansing agent can be exhausted by continuous use, particularly if you have carpets or porous wood flooring. Pet owners who find themselves repeatedly dealing with cat urine odors may become almost immune to the smell of their own home. However, your guests may not be as forgiving. Do keep in mind that if such cat urine problems become concentrated and uncontrollable, you may eventually be up for some serious home renovation.